We need an American version with all sorts of new and old military equipment. If one exists, please fill me in. 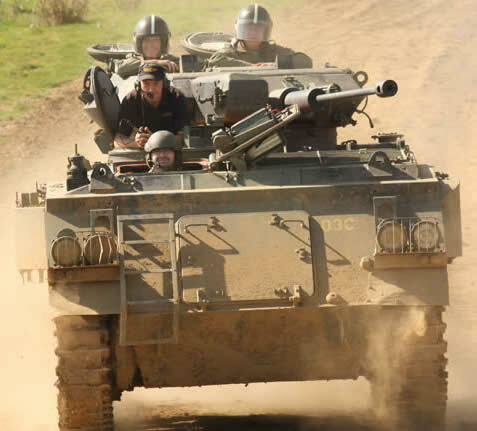 In order to do this particular tank paintball experience you’re going to have to head to Armourgeddon in the UK. It’s pretty expensive. I can’t imagine the cost of starting that up, especially if you wanted new equipment. Maybe some Abrams?! M113s, basically the US equivalent to the UK FV432 APCs being used there. I would say you could have 4 working vehicles, land to use, support facilities to keep the things running and insurance for less than half a million dollars. hahaha.. yeah that’d be cool, driving around abrams..
too bad they are no longer in production. This would indeed be awesome. I wonder what the range is on the pneumatic cannons. I think to make it really fun it would have to be over 1km so you could have actual gunnery battles rather than Sherman-style circle-and-fire battles. Surely it wouldn’t be that hard to turn an aircannon up to 11 and get some serious range out of it. The problem is that to retain that velocity in order to get a flat trajectory, you need some serious thought put into your projectile. A ball full of paint just won’t you, due to the low density of paint you would need a dart shape for high sectional density and aerodynamic shape. You would also need a fairly sophisticated sighting system including a range finder to guarantee hits. I doubt it would be as fun an experience though, since the emphasis of “circle and fire” battles is shooting *and* driving, while at longer ranges manouver would be less important than staying put and aiming properly. That was so much hype for some lame footage. There are several places to buy a used Abrams online. Just google 2350-21-901-3052. But would it be fair to show up at a paintball tourney with one? You would need someone with the AT-4 Trainer on the other side, wouldn’t you? Seems kind of … lacking. Without an earth-shattering KABOOM and a double-dose of recoil it seems rather meh.